Inspire is a new single-column, wide-margin New Living Translation Bible that will be a cherished resource for creative art journaling. It is the first Bible of its kind--with over 400 beautiful line-art illustrations spread throughout the Bible. Full-page and partial-page Scripture art is attractively displayed throughout the Bible, and the illustrations can be coloured in to make each Bible unique, colourful, and customisable. Every page of Scripture has two-inch-wide margins, with either Scripture line-art or ruled space for writing notes and reflections, or to draw and create. The generous font ensures optimal readability, and quality cream Bible paper is great for creative art journaling. Inspire is the only single-column, wide-margin Bible available in the popular New Living Translation, and it is designed uniquely to appeal to art-journaling and adult colouring book enthusiasts. NLT Inspire Bible Pack of 4 was published by Eden bundles in November 2016 and is our 31144th best seller. The ISBN for NLT Inspire Bible Pack of 4 is EDENBUNDLE-1787. 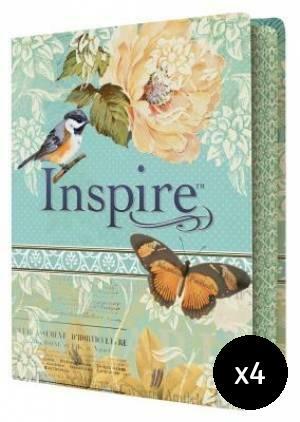 Be the first to review NLT Inspire Bible Pack of 4! Got a question? No problem! Just click here to ask us about NLT Inspire Bible Pack of 4.